How truly old are B cells (insights from a virus perspective)? The finding of an extinct virus hidden inside B lymphocytes might be the missing clue to how old these guardians really are. Increasing evidence has shown that, besides bacteria, our microbiome is also constituted by numerous species of viruses which remain in our tissues after infection. However, the long term effects of their persistence inside the cells are in most cases still to be determined. One such virus is parvovirus B19 (B19V), a small microbe that causes a very common rash during childhood and whose DNA is known to persist for life in almost all tissues; yet, the specific cell types where it remains hidden remain unknown. We hypothesized that, in order to sustain lifelong persistence, the host cell most be long-lived. We proposed lymphoid cells as candidates, since specific B and T cell lineages, responsible for guarding immunological memory, meet this profile. Thus, we isolated B-, T cells and macrophages from recently extracted tonsils. Although the isolation procedure is not complex, it is labor intensive and, due to the importance of working with fresh material, implied many daily visits to the surgery room. This translated into an average of 8km a day between the hospital and the lab, over a thousand test tubes with cells prepared over the course of two months and thousands of qPCR reactions run to quantify the virus. In our recent paper in Nature Communications, we show that B19V is primarily distributed in B lymphocytes but what was most striking was the finding in the cells of most of our ageing individuals a type of B19V that disappeared from circulation more than 40 years ago. This has a significant impact in terms of how immunological memory is kept. Indeed, it is known that the body is able to recall and mount a response against a specific pathogen many decades after the first infection, but what is not known is whether the cells that keep this memory are truly old, or have transmitted their phenotype to their descendants. From our findings, memory is kept by survival of original clones and, extrapolating from the age of our study subjects, these cells must be at least 40-60 years old. Moreover, we investigated the mechanism by which B19V enters B cells and showed by in-vitro cell culture and confocal microscopy that it utilizes the antibodies raised against itself to bind to Fc receptors on B cells and gain entry (Figure 1). Figure 1. Represented is a B lymphocyte, in green endosomes, in red B19V capsids and in yellow, the merged image showing that B19V IS localized within the endosomes (when anti-B19V antibodies are present in culture). Work remains to be done to find out if the virus within the B-cells is actually functional, i.e. whether it is partially or completely transcribed, whereby it might induce prolonged cellular activation and favor, in the long term and under specific conditions, the development of cancer or autoimmune diseases. This work was truly invigorating thanks to an awesome team work with amazing people. It wouldn´t certainly have been the same without the energy and hard work of Lari P. and Mari T. and the valuable input from all collaborators. Figure 2. 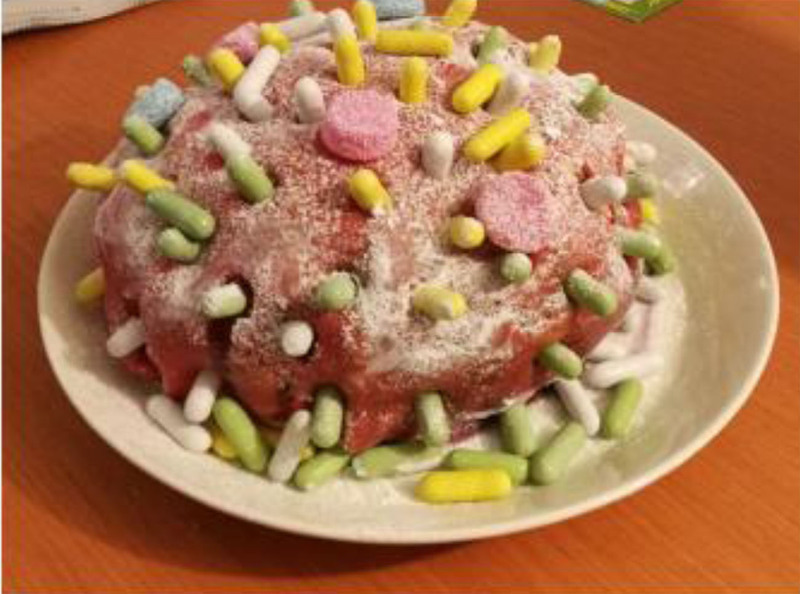 To celebrate Lari´s achievement, his girlfriend Mea made him a B-cell shaped cake, with lots of chocolate viruses hidden inside.